Beach weddings are so cool. Love the calm, beautiful ocean setting. The light and the blue and whitewash tones are a dream to capture. This is my beautiful friend Stephanie and a glimpse of her wedding I photographed in Santa Cruz. Stephanie is the quintessential California girl- free spirited, bohemian with a natural style and elegance. She is insanely creative and a true artisan with talents in so many fields. We've been friends for a very long time and have a history of adventures and laughs together from Venice Beach to Hawaii and the Pacific Northwest. It was so awesome to be a part of her wedding day and see her marry her guy. Congrats girl! Stephanie is the co-author of food and lifestyle blog: CaliZona. Full of inspiring vegetarian recipes, food photography, cocktails and more. Check it out here. Also more wedding photos coming soon! And we're back with Pinterest Pairings, a monthly blog feature which pairs one of my photographs with an image found on Pinterest. I love this series not only for it's visual and editorial task but especially to share some inspiring pins with you. This month is all about staying cozy in winter, it's actually snowing right now as I write to you from Switzerland. This is amazing to me (umm... beach girl here) and we are seriously learning some new life skills on how to stay warm, how to dress properly, how to build a fire, how to keep the house warm, what to cook, etc. Our life has changed so dramatically from tropical to alpine, that it feels like that was another lifetime all together, a strange feeling but also some kind of wonderful. Breakfast hasn't changed much, I still make pancakes whenever I can. Only now, there is no 'Bob's Red Mill' mix and maple syrup can be hard to find around here sometimes. Still, there is something so special about a Saturday morning batch of homemade pancakes, one basic little nosh you can do so much with, love them! Try these yum banana pancakes by Green Kitchen Stories via Stellar.co, simple. Left: photograph by Tanya Moss | Right: Banana Pancakes by Green Kitchen Stories on Pinterest. October it is! Even when I am way out tropical in south east asia, I am convinced with Autumn. I like to dream and remember- it's such a pretty time of year. I conjure up the falling leaves and crisp walks outside in a cooler clime. Picking up my children from school and going to the great Central Park in New York to run around, play, chase, scooters and more. Wearing Hunter wellies and crunching leaves under our feet, collecting vibrant colours, twigs and acorns to decorate the table tops and window ledges of our apartment. Stopping off for a hot chocolate at Le Pain Quotidien then a quick dash home to get dinner started before the earlier dark approaches. 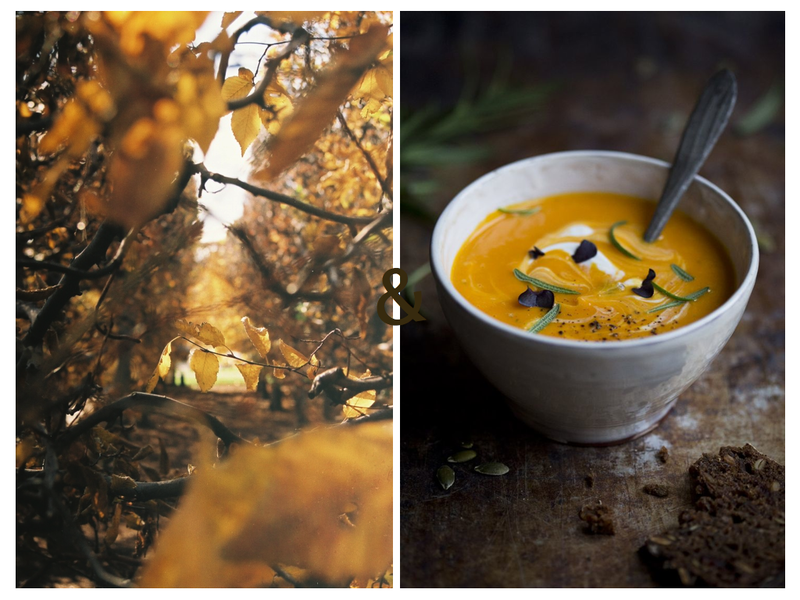 Here is a great idea for dinner, healthy and delicious and sure to keep the warmth of Autumn no matter where in the world- Roasted Butternut and Coconut soup served with crusty french bread. The coconut creme is a tasty mix with the butternut squash and adds a little tropical for our Autumn meals out here. Try it! Recipe from the wonderful 'Green Kitchen Stories' food blog, find it here. See more of my inspiration boards on Pinterest here.